​Super Bowl 50 is bound to be the biggest big game in NFL history. So it only makes sense that the festivities around it kicked off in the biggest way possible. 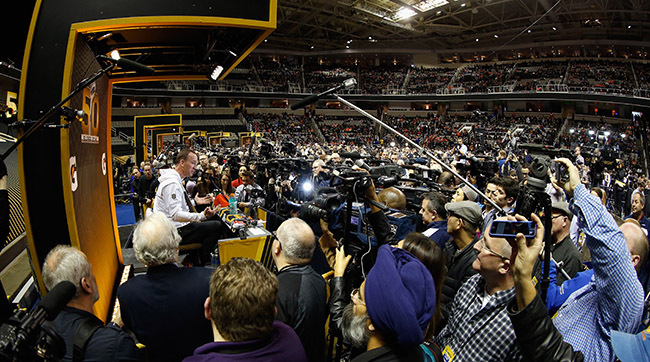 Players, coaches, fans, and media packed the SAP Center in San Jose, California, last night for Super Bowl 50 Opening Night. The event was a different take on the traditional Super Bowl Media Day, which typically happens the Tuesday morning before the Super Bowl. This year, Media Day was moved to Monday at prime time to give it more exposure. A replica of the Golden Gate Bridge was built across the arena, and it was used to introduce the Denver Broncos and Carolina Panthers players. (The golden color symbolized the 50th anniversary of Super Bowl.) Some players sat in booths while others mingled freely. But they all answered questions, joked, danced, and celebrated with nearly 5,500 reporters from all over the United States and around the world. The Super Bowl was obviously the topic on everyone’s mind. But one question loomed over SAP Center: Will this be Broncos quarterback Peyton Manning’s last game? ​Manning did take time to reflect on this legacy in the NFL. He has played 18 seasons with the Indianapolis Colts and Broncos, and this will be his fourth Super Bowl appearance. “I would like to be a known as a teammate and having the respect of coaches. I love football and always have,” Manning said. Broncos and Panthers are both equally aware of the significance of this game for Manning. “I have watched Peyton for a long time, and it is going be exciting to play against him. He is one of the best ever,” said Panthers linebacker Luke Kuechly. However the Panthers feel about Manning, they’re here to win a championship. And they’re not going to let Manning’s retirement talk distract them. “It has nothing to do with me. He is on the other side — doesn’t matter,” said offensive guard Chris Scott. 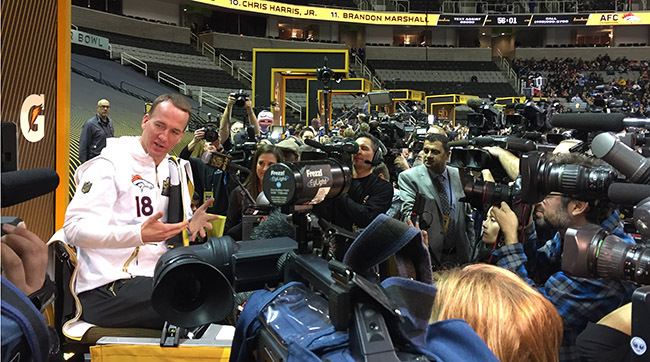 By moving Media Day to Monday evening, the NFL gave more fans a chance to experience one of Super Bowl week’s biggest events. Nearly 7,000 football fanatics were in attendance at the SAP Center. 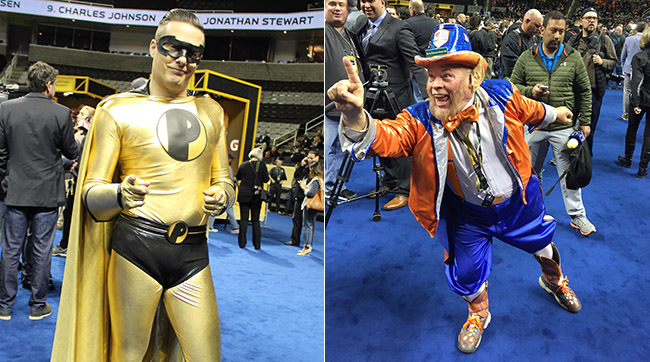 Fans also got to see the full range of crazy characters that show up to Media Day. Some do it to get noticed in the sea of reporters. Others do it for, well, other reasons. ​There was the Orange Man covered from head to toe including his face in an orange suit. And Rocky the Colorado Leprechaun in Broncos colors. And Pick Boy from Nickelodeon in a gold-and-black superhero outfit. An Austrian journalist attended with his skis and full ski gear. 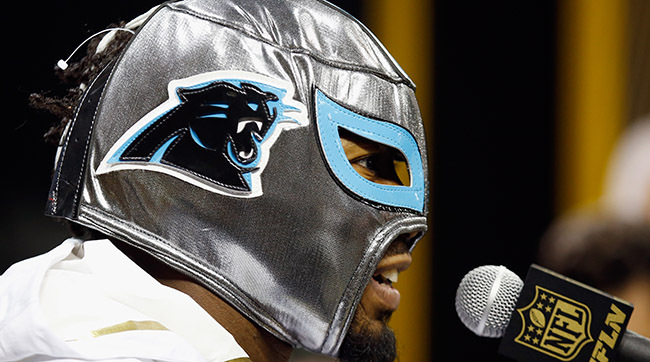 Even Josh Norman, Panthers cornerback, wore a Mexican wrestling mask that was given to him by a Hispanic reporter. Even Miss Universe was in the house. Pia Wurtzbach is covering Super Bowl for Inside Edition and was seen learning Dab dance moves made popular by Cam Newton. When she asked who he is, Newton smiled and said, "A Super Bowl quarterback."